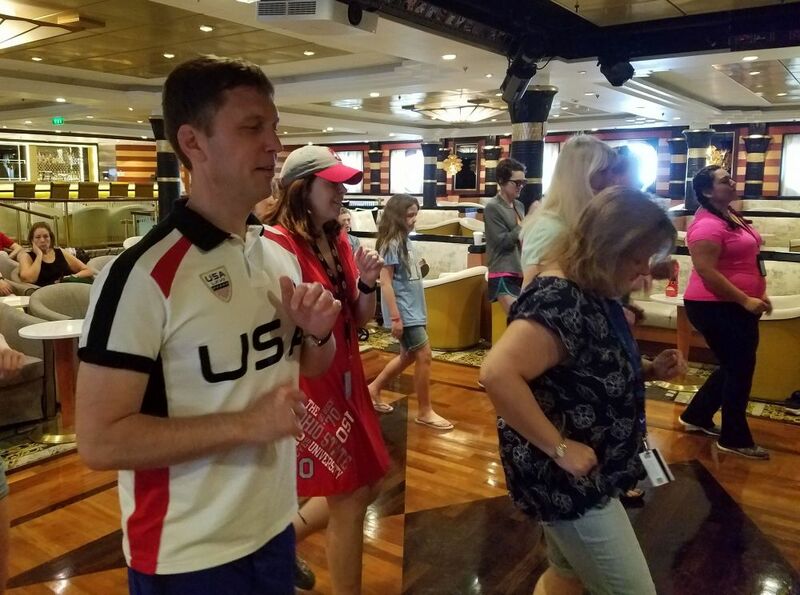 Flees.net - DJ's blog - We went on a cruise! We did a 7 day Caribbean cruise with DJ's sister, Lori, her husband, James, and their kids, Oliver and Lucy. We flew from Newport News to Houston and sailed from Galveston. 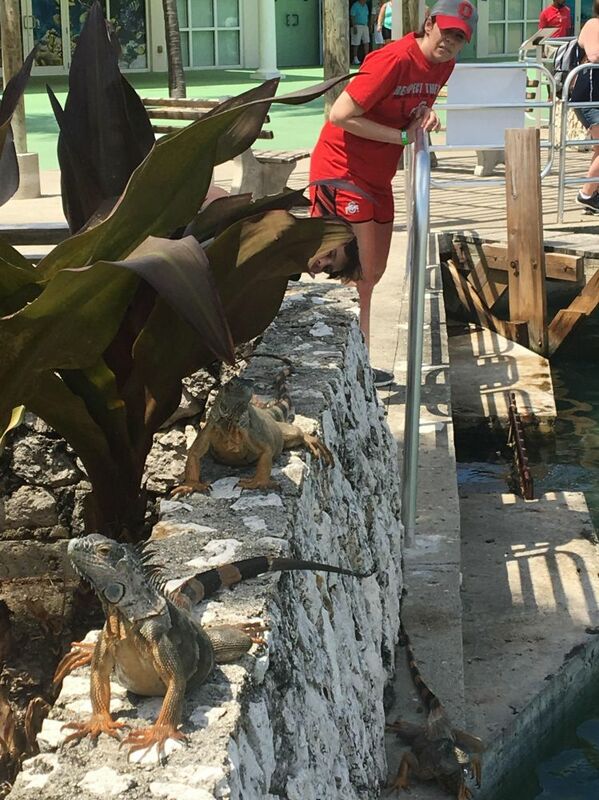 We had stops in Cozumel, Mexico; Grand Cayman Island; and Falmouth, Jamaica. 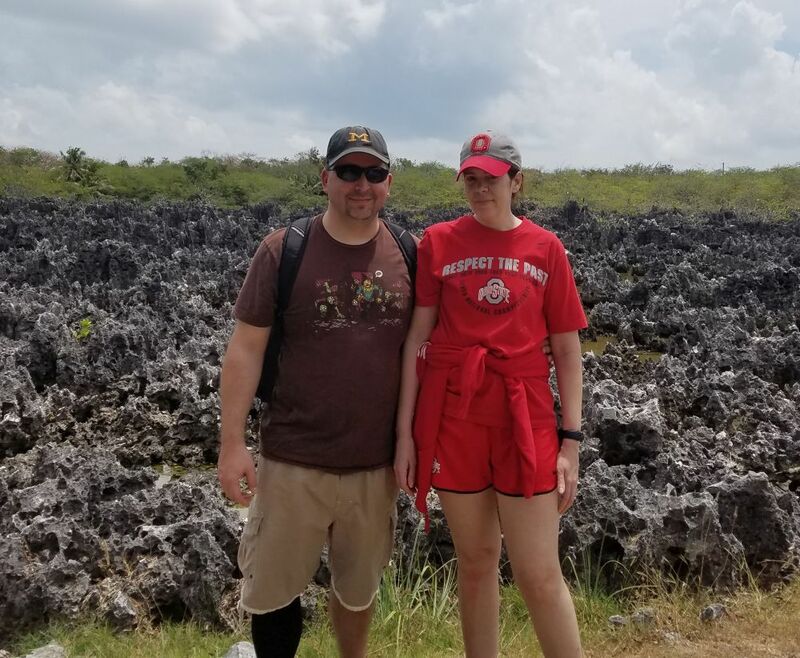 We did some cool shore excursions at each stop (Mayan ruins of Chichen Itza at Cozumel, an island tour of Grand Cayman, and a waterfall climb and cave exploration in Jamaica) and had lots of fun staying busy with a variety of activities and shows on the boat. See all the pictures form the cruise! A cruise was definitely a bucket list thing for DJ - he had always wanted to do one. It was definitely pretty awesome, but not so much that we would want to do one every year. Maybe every 2-4 years, with going to different places each time. It was really cool to see parts of three different places we would go see separately for a visit on their own. The ship was simplay amazing, a marvel of modern engineering. It was mind boggling at times. With that said, it was often too crowded, especially the pool deck area during peak times and the Windjammer Cafe during breakfast and lunch. Just swarms of people everywhere and difficulty finding places to sit. The shore excursions were a little too haphazardly organized and involved a little too much waiting around. Apparently, it is a much better deal to book things on your own instead of through the cruise line. That is a lesson learned for next time. The cost sneaks up on you. The initial price wasn't bad at all, but then we needed flights to get there (Not needed if you leave somewhere you can drive to, though), the shore excursions were not cheap, wifi was very expensive on the boat (we passed on that), and other little costs all added up. You can, however, eat and drink for basically free the entire week if you play it right. There are lots of opportunities to pay money for food and drink, but it is completely possible to stick to what is provided, especially if you do not drink alcohol. Our flight was at 6am, so we had to get up super early and get going right away. Luckily, the airport was only 20 minutes away, and was a small airport, so we were just fine getting there 50 minutes before our plane left. The two flights and stopover in Atlanta were uneventful (Kelley did get some Pink Berry), and shortly before 11am Central Time, we arrived in Houston. Our friend Josh & Amber, along with their three kids, picked us up at the airport and then we went to lunch at MOD Pizza, a favorite of ours from our last trip to Houston. We then went to go see A Wrinkle in Time (with mixed reviews from among us) and later had dinner at Genghis Grill before coming back to their house and watching some college basketball before bed. Amber made breakfast burritos for everyone in the morning and they were wonderful. We finished watching the Michigan game in the morning before getting ready and going to church with the family. Josh was playing drums, which was cool to see. Unfortunately, they did things a little differently that day and church ran 20 minutes longer than usual, delaying our departure for the boat. We decided to get lunch once we got to Galveston before getting us to the pier. Traffic derailed those plans and slowed us down by over an hour, so Josh and Amber had to drop us off at the pier and skip lunch. We checked in our suitcases and went to the processing line to get on the behemoth ship in front of us. The line was not big and after showing our passports and IDs to a couple people, we got our picture taken then received our Sea Pass (a combined room key/credit card for anything on the boat) and got on board. We eventually found our room (not as easy as it seems since deck 2 has two sides that do not connect - have to go up to deck 4 to get over to the other side) and dropped off our carry ons, then went to explore and hopefully find food. Since we were pretty late to the boat (arrived at 2:10pm - cutoff was 2:30pm), we quickly ran into the mandatory safety evacuation exercise that closed everything on the boat. Once that finished, we found the specialty burger shop on board (Johnny Rockets) and shared a burger, fries, and Vanilla Coke. It took forever to come out, though, and we ended up finishing it only two hours before our scheduled Mystery Theater Dinner, so by the time we went to that, we were not that hungry. We met in the Star Lounge and had a seat while the Theater started. It was called "Bada Bing Bada Boom" and was filled with super stereotypical Italian mobster characters. It was really cheesy and not very good. In the middle, someone got shot and we had intermission and went up 6 decks to Giovanni's Table, the fancy Italian restaurant on board. By then DJ was really starting to feel bad due to a headache and to top that off, the menu we were presented was super limited and did not feature any of the Italian classics we were anticipating (lasagna, spaghetti, fettuccine, etc), so we decided to just bail and get some pizza at Sorrento's, the pizza place with free pizza available all day. DJ's headache was making him a little nauseous, so he couldn't eat much and we headed to the room where DJ went to sleep and Kelley tried to find something to watch. It was an overall awful night and an inauspicious start. Luckily, DJ felt much better in the morning, and after 9 or 10 hours of sleep, he was ready to get going. 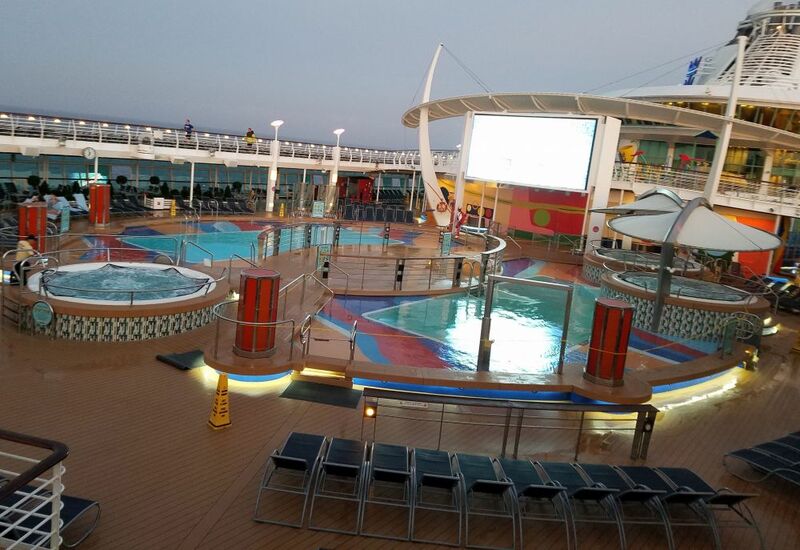 We started the day with 1.6 mile run on the running track on deck 12. Then we got food at the breakfast buffet with Lori, James, and the kids. This was followed by a line dancing class where DJ and Kelley got to learn line dancing for the first time ever. DJ eventually got crowded off the dance floor and used the opportunity to take a couple pictures, then it was time for the guys to bail and head to the table tennis tournament. DJ, James, and Lori all played and lost in the first round, so we left and headed down to the Schooner Lounge on deck 4 for morning trivia, which was some sort of general trivia thing asking questions like how many hearts does an octopus have. After that it was lunchtime and we ate at the Windjammer buffet. We followed lunch with spending some time at the pool. We alternated with watching the kids and swimming/hot tubbing/sitting on our lounge chairs. The girls got to watch a World's Sexiest Man competition near the hot tubs while the boys kept their chairs from getting stolen. Next up was the ice skating show. We got there plenty early and had front row seats. It was a show that went through history from ancient times until now with lots of costume and music changes. Once part had a skater dressed up as Fat Elvis skating around in a Vegas show and he came up to the rail and had Lori give him a peck on the cheek! From there we went to dinner in the formal dining room then after chilling out for a little while, it was time for the night time show of the Juggler/Comedian, Mike Price. He had a really great act, was quite funny and engaging, and a very talented juggler. He did some things I had never seen. By the time that was over, it was nearly 10 and were we bushed so we went to bed. This was the day of our first day in port. We were due to land in Cozumel, Mexico early in morning, and our shore excursion group had to meet in the Platinum Theater at 6:45am, so we got an early breakfast and got down there. Lori, James, and the family, ordered room service that never arrived, so they showed up with breakfast in hand (a little late as well! ), but we did not get going right away so they had time to eat in their theater seats. After a while, our group number was called and we filed off the ship onto the dock and after a short walk we got to a ferry to take us to Playa Del Carmen. The ferry was 45 minutes and was a pretty choppy ride - we were warned about seasickness, but it did not seem to affect any of us too badly on the way over. Unfortunately, after that 45 ferry ride, we had to stroll through town a bit to some buses for a 2 hour bus ride to the ruins site. They did provide a sack lunch and extra bottled water and Cokes, which helped. After an interminable bus ride, we finally arrived at Chichen Itza, a Mayan city in ruins. Due to the long transit time and the limited time our ship was in port, we were limited to only an hour on the site. But the site was amazing. 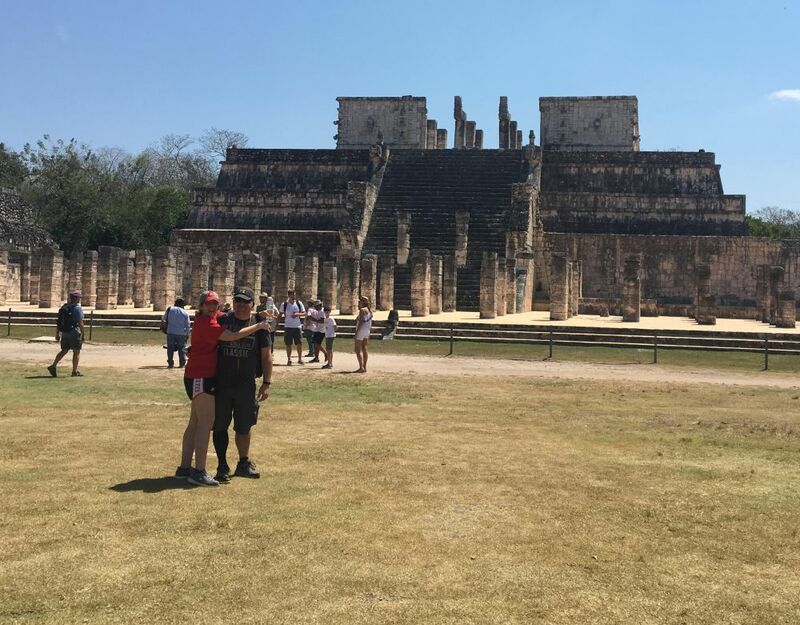 El Castillo, also known as the Temple of Kulkulkan, was the predominant structure and it was very impressive. Perhaps more impressive is that if you stand in front of the stairs that faced in each cardinal direction and clapped, the echo would sound like a native bird. How they managed to make that happen over one thousand years ago I have no idea. The tour guide walked us around and explained things and told stories, then gave us about 15 minutes to look at stuff on our own before heading back to the bus. There were also dozens of vendors selling handmade goods here - if I would have had more time I could have spent a lot of money. But, we were pressed for time and had to get to the bus. We did purchase a Temple of Kulkulkan carving and a Mayan calendar representing our wedding date. The bus ride back was even worse - it was super hot this day and the A/C was not the greatest. Then, the ferry ride back to the boat was awful - we were all tired and cranky and starting to not feel so good. Once we finally got back to the boat we started feeling better though. We went back to our room to rest a bit, then met up with Lori and James for dinner. Afterwards we went the Schooner Bar for Country Tune Trivia (I knew 2 out of 20) and some Euchre. We capped the night off with a show called "In the Air" that was meant to be some kind of Cirque du Soleil thing, but aside from a few moments, it was pretty boring and not very good. After that show, it was time for bed. Day 5 had us in Grand Cayman. We were not supposed to arrive in port until 10:30 or so, but we arrived early. This did not change things for us, since we had a pre-booked tour that started at a set time. We were able to sleep in a little bit and have more of a relaxing morning. We made our way to Platinum Theater at 10:30 and proceeded to wait a while before we were called to exit the ship and get on a tender boat for a ride to shore. Once ashore, we hung out at a tent for what seemed like a really long time before someone finally led us to the bus that would be doing our tour. We got on the bus and started driving around - the tour guide told us a bunch of stuff about Grand Cayman and the Cayman Islands on the way and pointing out places of interest. Our first stop was the town of Hell. Apparently, some guy found this place with jagged limestone rocks and thought it looked like Hell, so he named it that, and now there is a bar, gift shop, and post office there. We sent postcards to DJ's dad and Kelley's dad from Hell and took some pictures, then got back on the bus. Our next stop was the famous Tortuga Rum Cake shop. We got samples of the rum cake, which was good, and bought some snacks, but it was basically a pointless stop unless you really love rum cake or wanted to buy some rum. While there, our guide went and got us the Turtle Farm tickets, because that was our next stop and shortly we headed over there. The turtle farm was really cool. 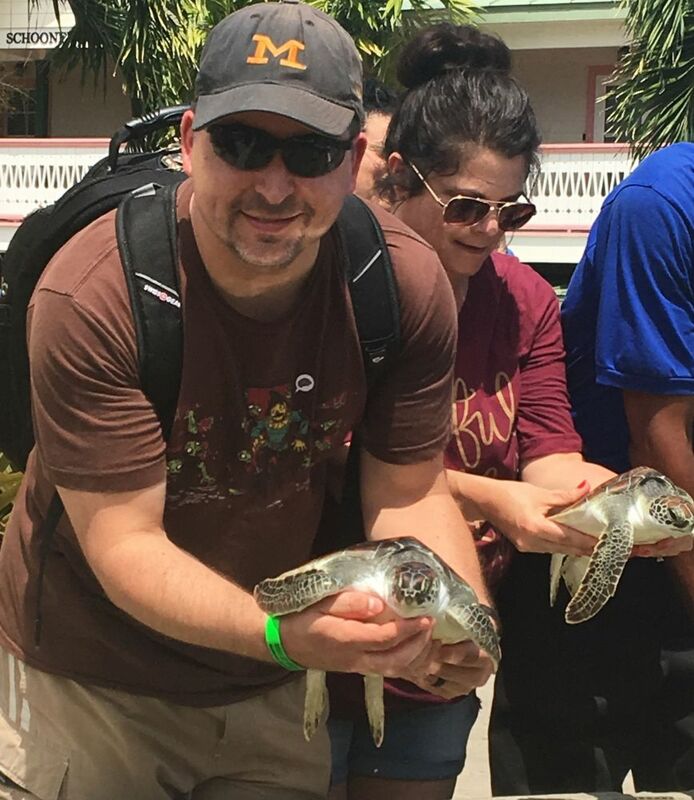 When you first walked in, you saw a large pool with tons of big older turtles, then as you walked around they got younger and younger, until you got to a place where you could hold them. They often started freaking out when you did so, and our tour guide showed us how you can pet their chins to calm them down. It was really cool. From there we hit our last spot on the tour, which was a semi-submersible. We got on a boat and went down below decks where there were windows underwater. We saw coral reefs, a bunch of different types of fish and some shipwrecks - at one point a guy jumped out and gave out a bunch of fish food drawing the fish to us. Overall it was fairly interesting, but definitely not amazing. The kids were bored most of the time. On the way back, we got a couple of DQ blizzards (they had interesting flavors, like guava and mango cheesecake) and then got back on the ship. We had dinner, then went to play cards at the Schooner Bar while doing some Elvis Trivia that we were all pretty bad at, but Lori at least knew a few. Then it was time for the night show, which was a Jazz Cabaret. It was really terrible so went quickly went back to the Schooner Bar and played more cards. Not long after that, a Polish guy who was awesome at guitar came and started playing and he got lots of applause all around. Once he was done, we all went to bed. Today, Falmouth, Jamaica was on the schedule. We started out with a morning walk, followed by breakfast, and then a hurried walk to the pier because we were running late and we got there with not much time to spare. Just after arriving at the meet up spot, we were escorted to the buses to take us to the Dunn River Falls. After a stop to buy mandatory water shoes, we arrived at the falls. At about 180 feet high and 600 feet long, the waterfalls are terraced like giant natural stairs though some incorporate man-made improvements. Several small lagoons are interspersed among the vertical sections of the falls. Once in the park and at the base of the waterfalls, we build a human chain holding hands while a guide led us up the falls and a videographer recorded the exploits (to sell us a DVD afterwards). It was a challenging climb that took about an hour and a half with various breaks in areas where the lagoons were. Overall, it was awesome and the kids especially loved it. On the way back to the bus there were a lot of shops with vendors aggressively pushing their wares. DJ got conned by a guy who said because he was the first one that day to talk to him, he'd give him a free carved girl with Kelley's name on it. Then he asked DJ his name and did another one with his name on it, then asked for money, after the name was on there. So of course DJ caved and gave the guy $15 - much less than his first offer of $40, but more than what another person bought them for ($10) which he did not find out until on the bus. After this we headed to the Green Grotto Caves, a large system of underground caves not far from the falls. The caves were pretty extensive and at the end of our tour there was an underground lake that was pretty amazing. While there, the tour guide turned out the lights and we got to experience utter blackness underground. It was pretty crazy. We got to see how people in the caves could communicate by banging of certain areas of rocks, and got to see a bunch of bats hanging around, as well as a snake and a bunch of spiders. It was a cool place to see, and interesting to hear about the story of the place. After this was done we got bussed back to the pier and spent a little time shopping and looking for jerk chicken, but failed to find any, so once on the ship we stopped and got a couple slices of pizza. Once on the ship, we headed for the adults only hot tub for a little bit before heading back to the room to change and then head to dinner. After dinner, we went to the Schooner Bar for movie music trivia - DJ was really good at this one and our team came just short of winning. Then we went to watch the NCAA tournament and see Michigan win its game against Texas A&M. We then met up with Lori and James at the ballroom area where a kids disco dancing competition was going on. We hung out there with them for a while then retired to our room to watch more NCAA tournament and then go to bed. Jamaica was the last port call, so our next two days were at sea. We started day 7 by heading up to the gym and using the elliptical for 30 minutes then getting breakfast. After breakfast, the group split up with the boys going to the water slides and the girls going to line dancing class. The water slides were pretty bonkers when you consider they were on a giant ship and a good deal of fun. After a little while, we all met up at the pool and had some pool and hot tub time until lunch. 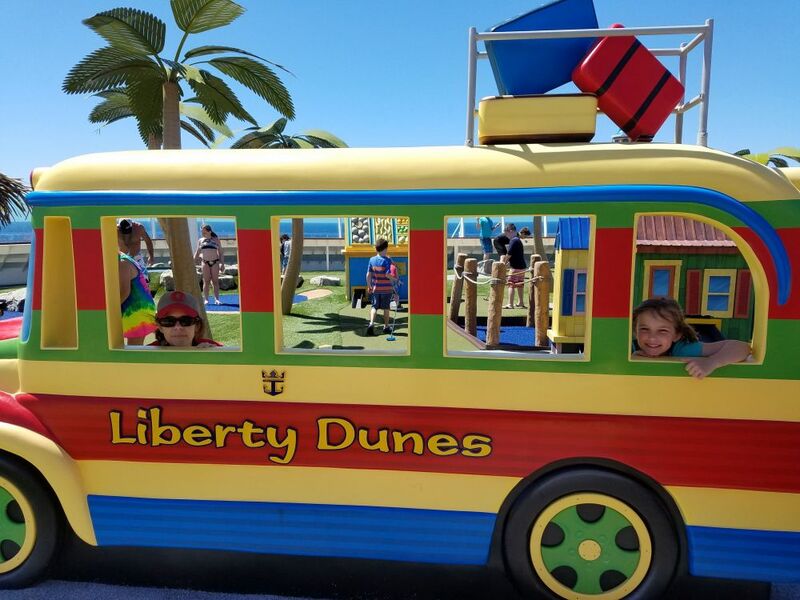 After lunch, we took Lucy to play a round of mini golf. The course was not great, but once again, it was on a freaking cruise ship, so it was cool. We delivered Lucy back to her parents and then grabbed our books and found a quiet place to read in the sun. Kelley caught a nap during this time and eventually it was time for dinner. After dinner we went to the lounge for a game of Family Friendly Feud. We were late, so we just watched the first round, but after that, Lori went up as the captain of our "team" and was selected to answer "what do you find in a park?" - she answered "children" but the #1 answer was "trees" so some other team got to go. It was funny and awkward watching people answer questions like' What do you use a hat for?" with super dumb answers like "to hold my sunglasses." Once that was done, it was time for the off Broadway show of Saturday Night Fever. 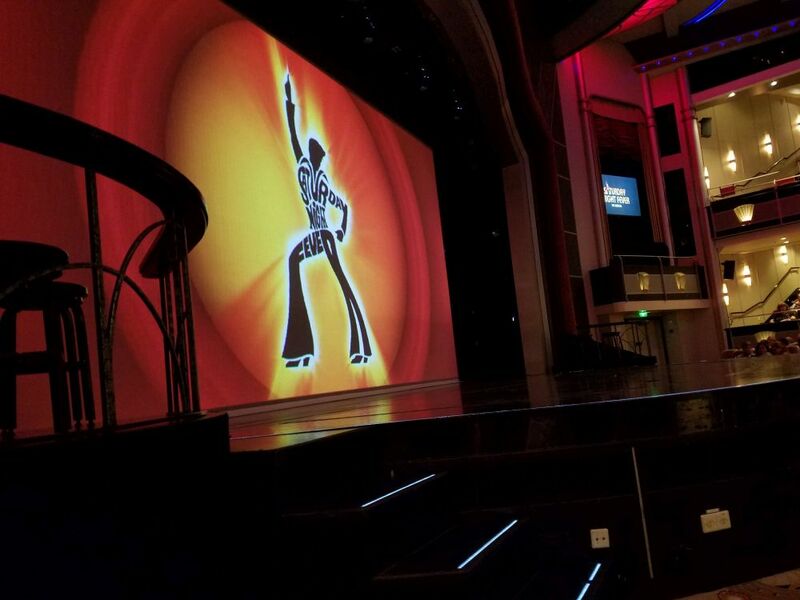 We sat super close to the stage, and despite our relative disdain for disco, it was pretty entertaining and the cast was fairly talented. After the show, we went back to our room and watched more NCAA tournament until we went to bed. Day 8 was our final day at sea and the first time we had two sea days in a row. We were definitely starting to feel a little "cruised out" by this point and were looking forward to getting home. After breakfast, the girls went line dancing again while the boys went to the pool. When the girls got done, they joined us at the pool and we played some cards until lunch. At lunch, we used the dining room for the first time instead of the Windjammer buffet and it was quite nice - we wished we had done that more often. We then went back to the pool area and enjoyed the adults only pool and the hot tub for a while, then went and did some Michael Jackson trivia at the Schooner Bar. Lori knew almost all of them and lost by only a single point, but we still got some pens and highlighters. After that it was time for dinner, followed by watching some basketball while we started packing. Then it was time for the final farewell show that led off with a comedian who was somewhat famous (had been on late night TV shows), but we were not familiar with him and forgot the name. He was pretty funny, but he had a really short set. After he was done the rest of the show seemed pretty lame, so we left while Lori and James stayed behind. We went back to our room to finish packing and watch more basketball. Lori and James stopped by not long after to tell us we did not miss much. Once we were done with as much packing as we could do, we went to bed as the next day was an early morning. We were up really early because the ship was due to come into port at like 6 or 6:30am. We got breakfast, but it was less packed than normal, which was nice, and then got our stuff together and then got into the line to get off the ship. It was a huge retarded line that did not move for an hour, but once it did start moving, it was pretty quick to get off the boat. Then we had to wait for our ride, Josh, because he ran into stupid cruise traffic. Once he got there, it was an uneventful ride back to their house. We had lunch with Josh, Amber and their kids, at a local burger place that was quite good, then after a while they took us to the airport. Our flight did not land until 11pm and we did not get home until almost midnight on Sunday night. Luckily we were both smart enough to take the next day off and get back into our grooves.